Gravy, an artisian and retail market benefiting the Boys and Girls Club of Transyvania County, was the brainchild of a group of very progressive and proactive women. These women remain active and volunteer regularly. With the generous contributions of the Home Builder Association of Transylvania County, Jennings Builders Supply and Hardware, Platt Architecture, Audio, Inc. and Brevard Paint and Decorating, we opened our doors in May 2006. There are 71 dealers at Gravy, many of them local artists, many of the products unique to the area. Each vendor donates at least 15% of their profits to our local club. A selection of products include: art, jewelry, antiques, baby/children's hats, backpacks and dresses, delightful nursery art, funky socks, charming aprons, wonderful cotton leisure and pajama products, woven scarfs, rugs and hand towels, wooden postcards and notecards, delicious baked goods, fly fishing supplies, dog toys, furniture, fresh plants and flowers, home decor, new and used books, locally produced jams, jellies and honey...the list goes on and on. We also offer products produced by and for the Boys and Girls Club including fresh produce. In the back of the store we have a Flea Market booth. The community donated items for this booth and the club receives 100% of the profits. 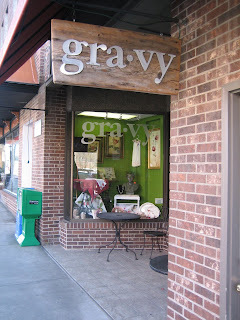 Gravy offers a Gift and Bridal Registry as well as Gift Certificates. In 2007, Gravy contributed over $24,000 in funds for the Boys and Girls Club. Figures are not yet in for 2008. We are located at 17 West Main Street, Brevard, North Carolina. Winter hours of operations are 10:00 am to 5:00 pm, Monday - Saturday. You can reach us at 828.862.4900 or email us at gravyonmain@hotmail.com.